The Port of Jacksonville in Florida is being impacted by dense fog and is delaying the arrival of one Carnival cruise ship. 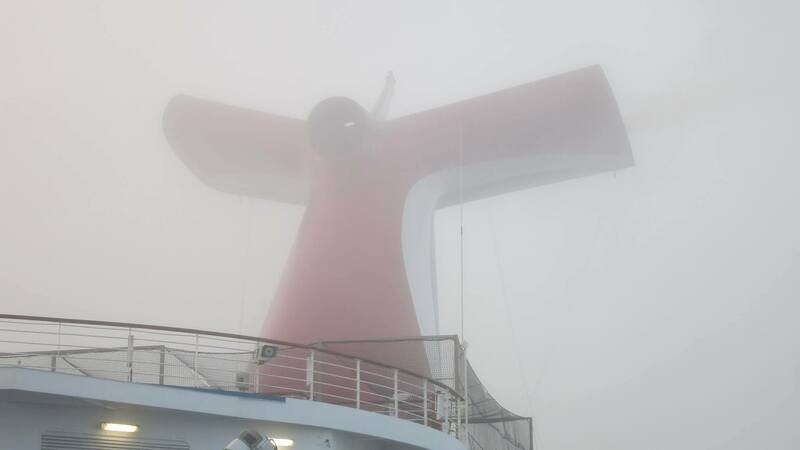 Carnival Elation is delayed arriving back into Port of Jacksonville, Florida today due to heavy fog conditions in the region and the Port of Jacksonville being closed. The ship was expected to arrive back at her homeport at around 8:00 AM but is staying away just off the coast until conditions improve. The Carnival cruise ship is coming to the end of a 4-day cruise to the Bahamas which departed the Florida cruise port on November 15. This now means that guests currently on the ship will disembark later than usual impacting travel arrangements. With a cruise ship arriving late it will also have a knock-on effect for when cruise passengers embark on the next scheduled voyage. Carnival Cruise Line is advising passengers set to embark on the November 19 sailing from Jacksonville not to proceed to the terminal until further notice. The Miami-based cruise line is updating via text messages, sing up using CCL1 to 278473 (CRUISE). Carnival will be posting an update at around 11:00 AM EST. Depending on the fog the vessel could be delayed even further, We’ll just have to see what mother nature does. It’s often the popular cruise port in Galveston, Texas which is hit with fog. We’ve posted several times of cruise ships arriving late after the port had been closed. Carnival Elation was scheduled to depart Jacksonville for a 5-night cruise to the Bahamas later today. The ship has scheduled calls in Carnival’s private island of Half Moon Cay November 21 and Nassau on November 22. This ship is expected to return to Florida on November 24. The Fantasy-class ship is 70,300 gross tons and has a guest capacity of over 2,000 at double occupancy.